Karaoke is an increasingly popular form of entertainment which lets everyone be a star! 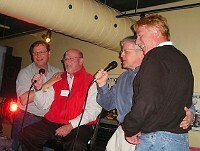 Karaoke allows you to sing along with the soundtracks to your favorite recording artists. 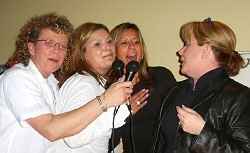 Having originated in Japan, Karaoke has now spread throughout Canada, the U.S. and the world. Millions now enjoy Karaoke at home and in clubs and restaurants. Karaoke is a Japanese abbreviated compound word which translates roughly as “empty orchestra.” Kara” comes from “karappo” meaning empty, and “oke” is the abbreviation of “okesutura,” or orchestra. Karaoke is used to describe any sing-a-long track which displays lyrics on a TV or video screen. Usually, a music disc consists of vocals and accompaniment. 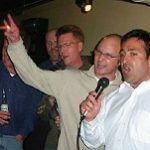 Karaoke tracks are professional recreations of the original song. They are NOT the original artist and may vary slightly from that recording. How close to the original each sounds is very subjective. A person, similar to a Disk Jockey, who provides a total Karaoke experience in your home or business. Sometimes through a contracting third party employer or by going direct to a supplier. Typical Karaoke shows are often 3 hours or more in length and can be found in a bar or nightclub. KJ’s often perform for private parties, weddings, corporate functions, even for kids! At Lighthouse Disc Jockey Service, we provide state of the art sound, lighting and full production of your event by bringing all the equipment necessary to make you look and sound the best you can be. Our DJ/KJ host will have cross references of over 1000 song titles (sorted by Artist/Title) and help co-ordinate all the singers, making the evening a huge success. A Karaoke show at Lighthouse includes professional sound system (mixer, equalizer’s, sound processors’, amplifiers with speakers on stands), par can lighting for the performer, a TV monitor to show the words (They change color as you sing along with the music), two microphones on stands, and a complete library of music necessary to fulfill your needs at the function. Depending on the budget, large screen video with projectors can also be made available so that everyone can follow along with the performer. We are not just Karaoke experts; our KJ/DJ’s also spin the tunes all night long, playing requests, keeping the energy upbeat, so that there is never a break in the entertainment. Be sure to ask about our various dance floor lighting packages. As an add-on to any of our standard DJ packages, basic Karaoke would only cost $200.00 more to complete your show. If you’d like large screen projection, an additional $200.00 would be added to the cost.